Diesels cleaner than gasoline vehicles, but sales dwindling. JATO analyst Felipe Munoz attributes last year’s emissions increase mainly to the downturn in demand for diesel cars. The average emissions for diesels continued to be lower than those of their gasoline counterparts. Europe’s campaign against automotive diesel engines backfires as the shift to gasoline in 2018 pushes average carbon-dioxide emissions to their highest levels in four years. An analysis by JATO Dynamics covering 23 markets in Europe found a direct correlation between diesel car sales and average CO2 emissions. Year-on-year CO2 emissions increased in 20 of the 23 markets analyzed, rising 2.4 g/km to 120.5 g/km in 2018. Amid increased negative public perception, combined with new government regulations such as the worldwide harmonized light-vehicles test procedure (WLTP) and scrutiny of the fuel type, demand for diesel fell 18% last year. JATO global analyst Felipe Munoz says the introduction of WLTP last September has been a challenge for the market, as a large number of available vehicles had not been homologated. JATO says the total value of CO2 emissions had been declining steadily since 2007, but started to slow in 2016 as the fall went from 4.1 g/km in 2015 to 1.4 g/km. At the same time, diesel-car sales fell from 7% to 1%. This trend was confirmed in 2017 with the first average CO2 emission increase in years of 0.3 g/km, and an 8% drop in demand for diesel cars. Munoz says last year’s emissions increase can be attributed mainly to the downturn in demand for diesel. The average emissions for diesel cars continued to be lower than their gasoline counterparts (3.2 g/km). “The positive effect of diesel cars on emissions has faded away as their demand has dropped dramatically during the last year,” Munoz says. Although the decline of diesel has had an impact on emissions, it wasn’t the sole cause. JATO says the arrival of new SUVs last year, including the launch of 16 new models, paired with an increase in demand for the vehicle type also contributed to the overall increase of average CO2 emissions in Europe. The emissions averages for SUVs worsened by 1.4 g/km, and the SUV segment accounted for 35% of passenger-vehicle registrations last year – the only segment to post a positive change in 2018. The SUV average was the fourth-highest and was surpassed only by small segments in terms of volume: sports cars, luxury sedans and vans. In contrast, the lowest-emission segments – city cars and subcompacts – posted a 1.5% sales decline. “In other words, consumers in Europe are opting for the vehicles with the highest emissions, so the industry’s growth is taking place at the expense of higher emissions,” JATO says. The correlation between the decline in demand for diesel cars and the increase in CO2 emissions was most evident when analyzing the data by country. Only three countries saw improvements in CO2 emissions in 2018: Norway, Netherlands and Finland. In Norway, the growing popularity of electric and hybrid cars with a 57% market share was large enough to absorb the 28% drop posted by diesel cars. In the Netherlands, the improvement was due to a 74% increase in demand for AFVs, which accounted for 11% of the total market. This market also is still strongly dependent on gasoline cars that make up 76% of the market. The worst performance was seen in the U.K., which has carried out one of Europe’s most aggressive campaigns against diesel. 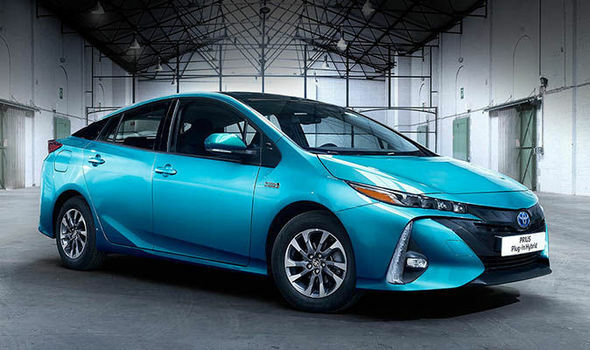 Toyota was the leader among the top-selling brands, posting an average below 100 g/km for the first time since tracking of average CO2 emissions began. Last year, 60% of Toyota’s sales were within the hybrid range (above, left) and it was one of only five brands to see an improvement in comparison to 2017, with emissions falling 1.4 g/km. Nissan saw the most improvement thanks to the strong performance of the Leaf, which became Europe’s top-selling electric car in 2018.